Wiley. Hardcover. 0470547561 New Textbook, Ships with Emailed Tracking from USA . New. 2010-05-03. New. Ships with Tracking Number! INTERNATIONAL WORLDWIDE Shipping available. Buy with confidence, excellent customer service! 2015-05-07. New. Ships with Tracking Number! INTERNATIONAL WORLDWIDE Shipping available. Buy with confidence, excellent customer service! Wiley, 2010-12-08. Loose Leaf. Good. DB John Wiley. Paperback. GOOD. Spine creases, wear to binding and pages from reading. May contain limited notes, underlining or highlighting that does affect the text. Possible ex library copy, thatâll have the markings and stickers associated from the library. Accessories such as CD, codes, toys, may not be included. Wiley, 2015. Hardcover. New. 10.1 x 8.3 cm. Wiley. Hardcover. 1118170512 Special order direct from the distributor . New. 2007-12-10. New. Ships with Tracking Number! INTERNATIONAL WORLDWIDE Shipping available. Buy with confidence, excellent customer service! 2015-05-07. Good. Ships with Tracking Number! INTERNATIONAL WORLDWIDE Shipping available. May not contain Access Codes or Supplements. May be ex-library. Shipping & Handling by region. Buy with confidence, excellent customer service! Wiley. Hardcover. 1118170512 New Book, Ships with Emailed Tracking from USA . New. Wiley India Pvt. Ltd, 2011-01-01. Paperback. Good. Wiley, 2010-12-14. 6. Hardcover. Used:Good. Wiley. Hardcover. 1118170512 US Edition Textbook, May Have Highlights, Notes and/or Underlining, BOOK ONLY-NO ACCESS CODE, NO CD, Ships with Emailed Tracking from USA . Good. Benjamin-Cummings Publishing Company, Subs of Addison Wesley Longman, Inc, 1991-09-01. Paperback. Used:Good. 2011-07-06. New. Ships with Tracking Number! INTERNATIONAL WORLDWIDE Shipping available. Buy with confidence, excellent customer service! 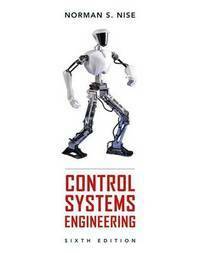 Control Systems Engineering 6th ed. NY: John Wiley & Sons Inc, 2000 Third Edition. Paperback. Very Good/No Jacket. Oversized. Wiley. Hardcover. 0470547561 New Condition. . New. Wiley. Hardcover. 0470547561 Like New Condition. . Fine. 2011-07-06. Good. Ships with Tracking Number! INTERNATIONAL WORLDWIDE Shipping available. May not contain Access Codes or Supplements. May be ex-library. Shipping & Handling by region. Buy with confidence, excellent customer service! Wiley. Used - Acceptable. Used - Acceptable 7th Edition Worn but functional. Choose EXPEDITED shipping for faster delivery! 2010-05-03. Good. Ships with Tracking Number! INTERNATIONAL WORLDWIDE Shipping available. May not contain Access Codes or Supplements. May be ex-library. Shipping & Handling by region. Buy with confidence, excellent customer service! Wiley India Pvt. Ltd.. PAPERBACK. 8126537280 Good condition international edition textbook. . Good. Wiley. Hardcover. 0470547561 US Edition Textbook, May Have Highlights, Notes and/or Underlining, BOOK ONLY-NO ACCESS CODE, NO CD, Ships with Emailed Tracking from USA . Good. John Wiley & Sons. Hardcover. 0471794759 US Edition Textbook, May Have Highlights, Notes and/or Underlining, BOOK ONLY-NO ACCESS CODE, NO CD, Ships with Emailed Tracking from USA . Good. Wiley, 2010-12-14. Softcover. New. ***International Edition***Soft cover/Paperback*** Textbook printed in English. ***Brand New***. Most international edition has different ISBN and Cover design. Some book may show sales disclaimer such as "Not for Sale or Restricted in US" on the cover page but it is absolutely legal to use. All textbook arrives within 5-7business days. Please provides valid phone number with your order with easy delivery. Wiley India Pvt. Ltd. Used - Good. Ships from the UK. Former Library book. Shows some signs of wear, and may have some markings on the inside. 100% Money Back Guarantee. Your purchase also supports literacy charities. John Wiley & Sons Ltd. Used - Good. Ships from the UK. Former Library book. Shows some signs of wear, and may have some markings on the inside. 100% Money Back Guarantee. Your purchase also supports literacy charities. 2007-12-10. Good. Ships with Tracking Number! INTERNATIONAL WORLDWIDE Shipping available. May not contain Access Codes or Supplements. May be ex-library. Shipping & Handling by region. Buy with confidence, excellent customer service! Wiley India Pvt. Ltd.. PAPERBACK. 8126537280 Item in acceptable condition including possible liquid damage. As well, answers may be filled in. Lastly, may be missing components, e.g. missing DVDs, CDs, Access Code, etc. . Fair. John Wiley & Sons Ltd, 2011-01-01. Paperback. Good.